VICE President General Constantino Chiwenga (Retired) yesterday pledged Government support in funding a prototype for Platinum group of metals Processing Plant design developed by the National University of Science and Technology. The innovation which will be used for the refining and processing of platinum to its end product is expected to save the country millions of dollars. 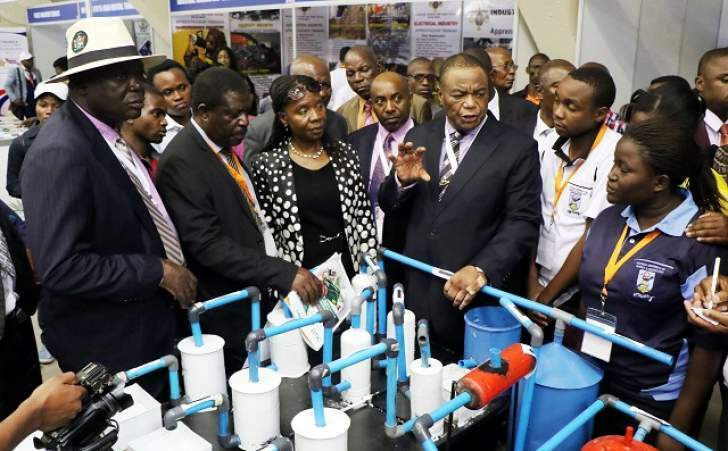 VP Chiwenga was impressed by the innovation developed by four chemical engineering students and immediately during his tour of stands at the on-going Zimbabwe International Trade Fair in Bulawayo, told senior officials that a fund has to be availed to support the prototype. He marvelled at the invention saying it could benefit the country, which was sending unprocessed platinum to South Africa for refining at a high cost. In an interview, VP Chiwenga said the invention was very key in the processing of platinum, a key mineral in the economy. "People have actually come up with ideas. When you go to the educational exhibitions it was quite interesting to find out that Nust has come up with a prototype of processing our platinum," said VP Chiwenga. "Right now we are sending our mineral for processing in South Africa and I have encouraged the office of the President and Cabinet to help find money to give to them so that they can develop that prototype they have with all our research institutions and the Ministry of Higher Education being involved so that we really come up with a refinery of our own because they have now come up with ways of separating up to seven by products of our platinum. "We will be presenting this matter to colleagues in Government to say let's give them what they want and let's have them to come to fruition to their prototype of processing their platinum," said the VP. He said displays by universities were encouraging and should be supported. The Vice President said it was quiet interesting from the academic point of view that institutions have a way of testing breast cancer and determining various diseases. "So from our youth at school, students in higher education, they are coming up with a lot of ideas, right up to the companies who have come to the floor, there is a lot," said VP Chiwenga. He said while the country continues to import technology from other countries, it was high time ideas that were being showcased at the ZITF are developed further to support the economy. Rtd Gen Chiwenga asked the cost of developing the prototype and said he would be waiting for the response so that he takes it to Cabinet. The platinum group of metals processing plant model was developed by chemical engineering students, Munashe Chivi, Fortunate Chirove, Blessing Moyo and Nicholas Jim. National University of Science and Technology (Nust) director of communications Mr Felix Moyo said the prototype, once fully developed, would go a long way in saving millions used in purifying platinum in other countries. "So far what is important is that this last section which is part of the research will bring a lot of benefits into the country because so far our PGM companies – Unki, Mimosa and Ngezi process up to concentrate which is then taken outside the country for purification," he said. Mr Moyo said purifying companies do not declare other products in the platinum concentrate. "The people who are purifying the concentrate outside the country don't declare other products to us, they only declare the platinum because we are saying to them, here is a platinum concentrate so they only tell us how much platinum they have purified. They don't tell us how much gold, how much copper colbart they found," said Mr Moyo. "This (prototype) is a huge benefit to us, we've been talking about value addition as a country. This one is simply a straight forward way of value addition."